Model Year / Registration Year? I'm a slow learner and am still confused about model year (MY) and registration year (RY). Maybe I don't understand the importance of RY. I hope you can clear this up for me. 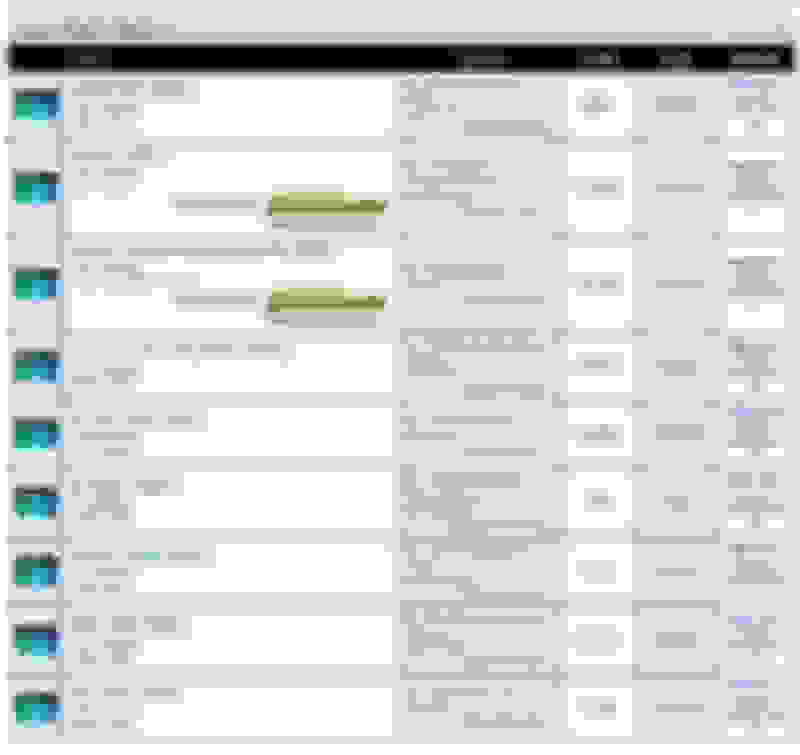 This Forum shows "XK/XKR (X150) 2006-2014", which I presume are model years. The first MY in North America was 2007. So, it appears that the first MY in Europe was 2006. Am I wrong? In the USA, motor vehicles are registered (issued a license plate/tag) for a 12-month period that usually doesn't correspond to the calendar year. Laws vary by state, and often the renewal date is the owner's birthday instead of the anniversary of the date of sale. The RY has nothing to do with the MY, which is determined by the manufacturer and does not necessarily correspond to the calendar year in which the vehicle was "born". Vehicles are sold based on MY, not RY, as a new owner in another state must register that vehicle in his name and get a new tag even if the previous tag has not expired. Some states base that annual registration fee on the assessed value of the vehicle, so in effect you're paying a sales tax every year to get a tag. You bought it once, but still get tagged every year for sales tax. My state, Georgia, was like that but changed their law several years ago, except that vehicles bought before 2013 still pay the annual ad valorem tax. One of my favorite X150 models is the Europe-only special edition 4.2L 2008 XKR-S with Vortex wheels. I believe that was the final year of the 4.2L engine. So, if I'm right, why wasn't the first MY for the 5.0L 2009? 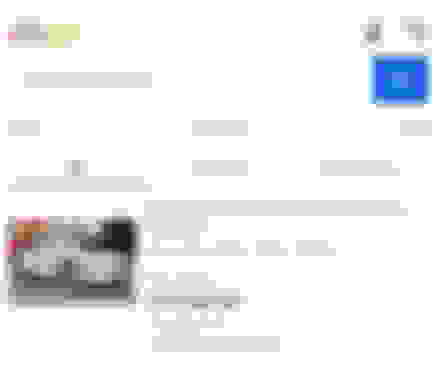 Last edited by Stuart S; 02-03-2019 at 08:12 AM. Reason: Added P.S. Jaguar traditionally introduced a new Model Year in August immediately after the factory shutdown for the Summer holiday. It also co-incided with the British Motor Show where the new models received much media coverage and were introduced to the public. The XK was introduced in 2006 in the UK as 2006.5MY in both Coupe and Covertible body styles with the Normally Aspirated 4.2 litre engine. The Supercharged XKR followed in 2007MY. The 5.0 litre was introduced in 2009 for the 2010MY. The first production car (VIN B00379) rolled off the production line in December 2005 and production ended on Thursday 24th July 2014 with the last 2015 MY XKR Coupe (VIN B56794). Both of these vehicles were donated to JDHT (Jaguar Daimler Heritage Trust). Starting in 2014, the Model Year was harmonised to commence with Calendar Year. Another date enters the equation with vehicles imported to the US where they are assigned Registration Year. I undestand several members have XK's with registration document showing them to be 2015 models. Very confusing! It used to be even more complicated up to the time of the X300 where a second VIN was allocated to vehicles imported to the US. Many instances have been reported on the forum where these second VIN's have significant differences from the actual vehicle specifications. The only country that appears to have resolved this anomoly on dates is Australia. Imported vehicles must carry a plate with the actual Manufactured Date. 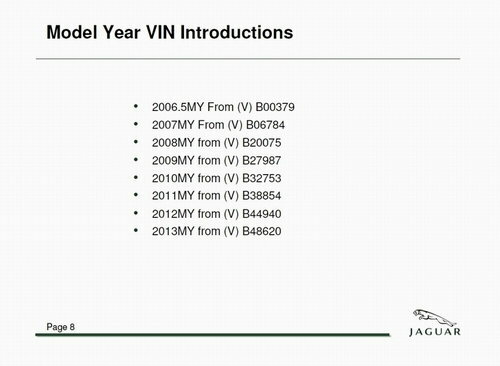 Just FYI the "2008 XKR-S" is actually a 2009MY according to the VINs and the build specifications. Everyone calls it a 2008 because that's when it was made public, and the cars delivered to customers. The problem mostly stems from the UK registration system (years on number plates), and that manufacturers release cars "early". There are actually some 5.0L 2010MY XK's in the UK which were built & registered in 2008. 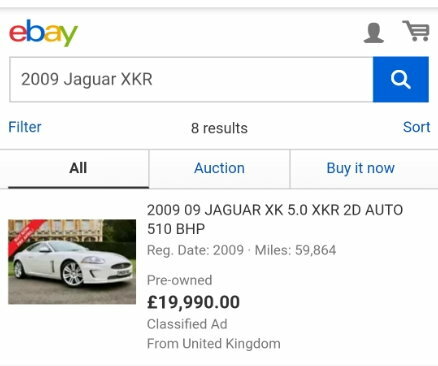 My 2014 XK Signature left the Jaguar factory on 8th April 2014 and is 2015MY in the documentation and on TOPIx. The XK Signature and Dynamic R were announced on 22nd January 2014 with deliveries commencing in March. They are ALL designated 2015MY. I have a U.K. XK-R manufactured in 2013 with a MY2014. Back in the day - the 50's and '60's - American car manufacturers introduced a new body design with every model year. Even though that new design was manufactured and made available for sale before the end of the calendar year, it was titled (registered) as the following year model. My brand new 1960 Corvette was delivered in October 1959 and titled as a 1960 model. It was much easier to tell the differences between model years back then. I miss that Vette but am glad I sold it. Back in the day - the 50's and '60's - American car manufacturers introduced a new body design with every model year. Even though that new design was manufactured and made available for sale before the end of the calendar year, it was titled (registered) as the following year model. When I was a kid, I was always jealous of my best friend, as his dad worked at a GM/Chevy plant, and he'd have time off in the summer for 'change over', and my friend was always off on some great vacation (while I'm out in the field, hoeing weeds). The 'change over' was to change the assembly line to produce the cars for the next model year. So, as you say, the 1960 cars would start production and sales in the fall of 1959, and continue production until the summer of 1960. I thought that was still the case. You start seeing advertisements and sales for the next year's models in the fall of the current year. I think this Johnny Cash song puts everything into perspective with the last line answering your question! Enjoy! That's great! I'm glad I listened to it. Yes, it is - but now there's not as obvious a difference between model years. Manufacturers will often "build" ahead of shutdown change over so that current MY production can continue in B&A until the official new MY change is completed. Just offering this info up for consideration as to why some MY products occur at odd times in advance/following a calendar year. Last edited by pwpacp; 02-04-2019 at 03:35 PM. This is so weird. My "nonexistent" XK is VIN B00031, so I would assume it is actually a fairly old car if it really precedes B00379. On the other hand, 10th char in VIN is 7, implying 2007MY. Furthermore, Topix states it's a "Finland spec" car and I've been told by people who used to work at the dealership nearby that this very car was used as a training car and a demonstrator there. However, its first registration in Finland is a relatively late 2008-01-03. The VIN sequence will almost certainly have commenced at B000001 with development and test prototypes followed by press and demonstrator vehicles before the official "production" series began at B000379. Your early VIN ties in with the background of it being used as a training and demonstrator car in Finland. Er, it doesn't "imply", it "defines". I am aware, but I chose the word intentionally since my car is most likely significantly older than 2007. Its serial number precedes the first production car, built in 2005 december, by over 300 units, and for example its adaptive dampening control module (an "engineering sample") is dated "08/5/05". 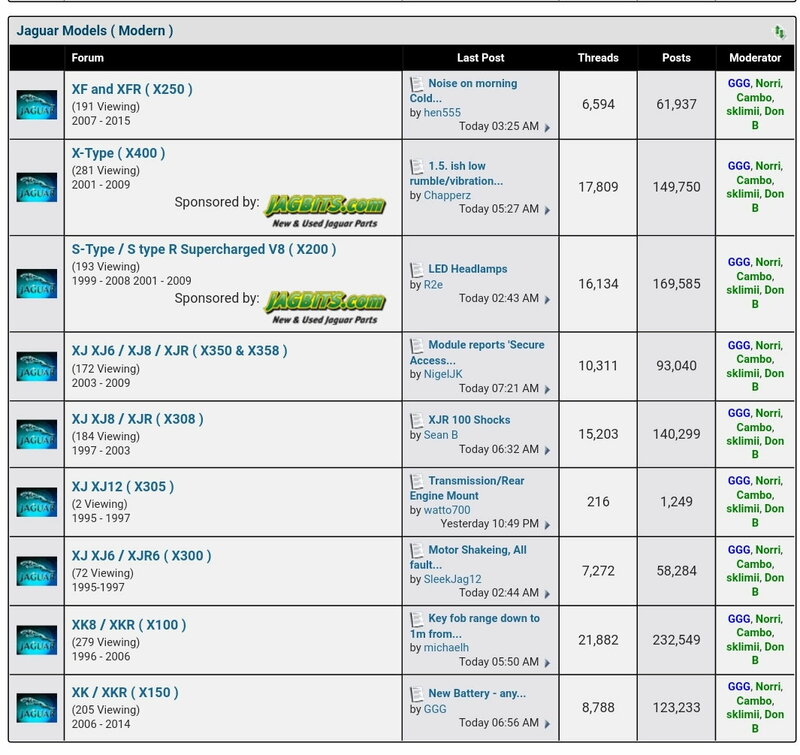 I had a 4.2 XKR which showed as a MY08 on SDD. I helped a local guy diagnose an issue with his car, SDD showed it as a MY09 but his car had a much earlier VIN than mine. Not sure what happened there. For what its worth: My 2013 XKR vert was the 868th MY 2013 which was manufactured in July of 2012. The Jaguar X150 is like a beautiful woman who doesn't tell her age. It's all about the mystery and never looking old. Like the E-type, to which the X150 pays homage, being born with classic lines is timeless beauty. It's a love at first sight that never fades. XK8 Cpe. build date for parts purchase? Quick Reply: Model Year / Registration Year?